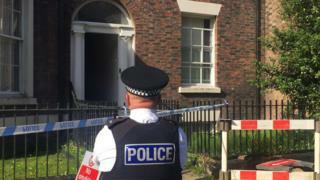 The bodies of a woman and two children have been found at a flat in Liverpool that John Lennon lived in. Police were called to a ground floor flat on Falkner Street, near Toxteth, Liverpool shortly before 19:30 BST on Tuesday. A man, 30, was detained on suspicion of murder before being taken to hospital after falling ill.
Merseyside Police believe the incident was domestic in nature. It said it was not looking for anyone else. A police spokesman said tests were being carried out on a substance found at the scene. The arrested man was taken to hospital before being discharged and taken to a police station for questioning. The force added a post-mortem examination will be carried out to establish the causes of death. Neighbours said the property in the Georgian Quarter was regularly visited by Beatles fans on tours of the city. The flat was once owned by the band's manager, Brian Epstein, and Lennon lived there with his first wife Cynthia shortly after they married in 1962. A neighbour, who did not want to be named, said: "The tours are always stopping at the house because John Lennon used to live there." He said a family with two young children had lived in the flat. "I didn't know them, I just knew there was a family living there. The children were toddler age," he said. Properties on the street were evacuated because of concerns over a gas leak but residents have been allowed back into their homes, said police. Falkner Street and Catharine Street were closed but the roads have since reopened. One woman said: "The police said we had a couple of minutes to get out of the house. "There were ambulances, fire engines and police here. We weren't allowed back in until about 11pm." Detectives are appealing for anyone who may have information to contact them. John Lennon, who was born in Liverpool in 1940, divorced Cynthia in 1968 and married Yoko Ono the following year. He was murdered by Mark Chapman, who shot him on 8 December 1980, in New York. Cynthia Lennon died in 2015. Tour guide Jay Riley, 67, stopped outside the property earlier while taking tourist David McGann, 35, from Melbourne, on The Beatles Fab Four taxi tour. He said: "This is where John and Cynthia, his first wife, spent their honeymoon and where he wrote the song Do You Want to Know a Secret. "The reason he wrote the song Do You Want to Know a Secret is because this was Brian Epstein's secret apartment. "Brian Epstein was gay and up until 1967 in England it was illegal to be gay. He added: "This is why it was called his secret apartment." Mr Riley said he visits the flat about twice a day on tours.